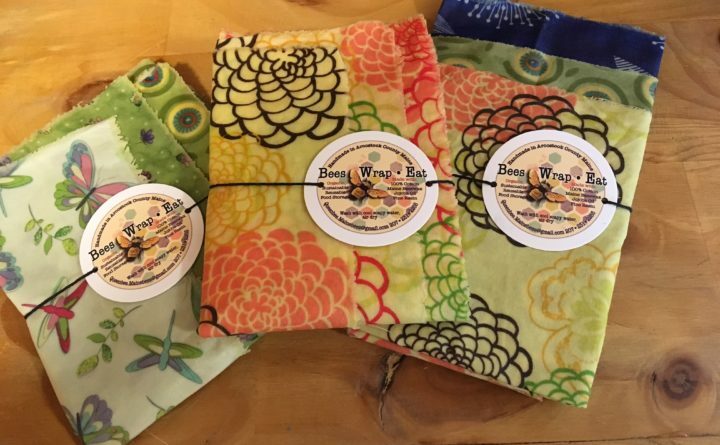 Beeswax-infused natural fabric is a natural alternative to plastic wrap. For honey bees, wax is one of the building blocks of life — literally. The bees produce and use the wax to build the combs in the hives in which they raise their brood, and store pollen and surplus honey to eat over the winter. Humans have been using beeswax for centuries to make candles, wax tablets, lubricant, sealing wax and even as an ancient form of dental fillings. Beeswax and beeswax creations have been found in Egyptian tombs, wrecked viking ships and in Roman ruins. It never spoils, and can be reheated and reused. Holly Hardwick began creating beeswax products a few years ago after she was contacted by a local beekeeper asking if she could clean and melt his beeswax. But Hardwick knew she needed some expert help. Crayons created using natural beeswax are among the many products people are developing using the wax. Now Rayder, owner of Nutritious Skin in Madawaska, and Hardwick create natural beeswax candles, salves, balms, soaps, food wrap and crayons in northern Maine. Farther to the south, the folks at Fabula Nebulae are creating what they term “farm to tub products” using beeswax as a base ingredient. Fabula Nebulae was created by Gintautas’ sister and company CEO Pasaka Griciene and her husband Jonas Gricius. In addition to its soothing properties when used as a balm or salve, beeswax has a more practical application, Ginautas said. Ginautas estimates they use about 80 pounds of beeswax a year, most of which they obtain as pure bricks from a supplier in Pennsylvania that uses solar energy and other sustainable methods to render the wax. Hardwick, on the other hand, renders her own wax using a simple — if messy — at-home method. The wax arrives at Hardwick’s shop from a local beekeeper in blocks that look like dirty bricks. She places that raw wax into an old pillow case which she then puts it in water warm enough to melt the wax. 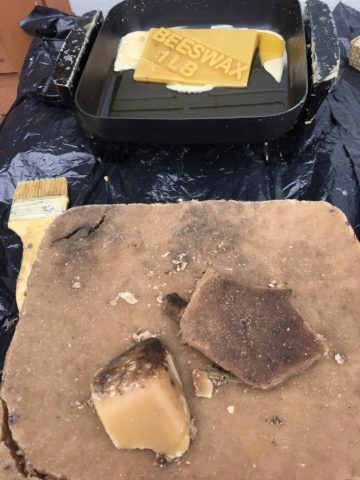 Raw beeswax (foreground) with a clean block ready for melting. The next morning, Hardwick skims the clean wax off the top of the water. Hardwick repeats the process at least three times, or more, if the wax is destined to be used in cosmetic products. Bees make beeswax using special glands in their bodies that convert the honey they eat into wax which then oozes through the bee’s pores and ends up as tiny flakes on their abdomens. The bees collect this wax and chew it to combine it with their saliva and soften it to the point they are able to use it to build or repair comb in the hive. It’s also used by the bees to “cap” or seal up individual sections in the comb to preserve the honey. Beekeepers remove these beeswax caps as the first step in the honey harvesting process. Gavin said there is a great deal of interest in the wax and the products made from it. “Yeah, we sell a lot of it,” she said. At Fabula Nebulae, Ginautas said the interest in products such as their skin-soothing “Salve to Quiet the Storm” remains high. Hardwick agrees and is always on the lookout for the next beeswax creation. Most recently she has been experimenting with the ancient art of batik, in which the wax is used to create tye-dye-like designs on natural fabrics. 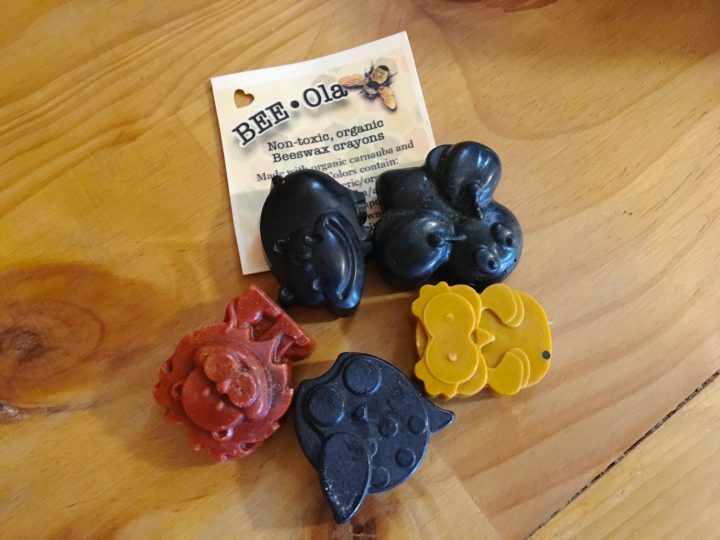 She currently sells beeswax creations including crayons, salves and a food wrap she dubbed Bees Wrap Eat at her shop Northwoods Nectar in Eagle Lake and in her online Northwoods Nectar Etsy store. And she has no plans to stop exploring beeswax options.